This page describes how I decide on which horses I back. Note that this article is based upon the principle of Value Betting, or Betting with an Edge. If you are unsure of what Value Betting is then please first read this discussion on Value Betting. There is nothing missing from here. Everything that you need to know to replicate what I back is given all, one one needs each day is the Daily CSV file from the Members' Area and, of course, the current prices available. This shows how I select my main selections. There are times when I manually cherry-pick horses but these form only a small part of my betting strategy whereas this value betting approach constitutes about 95% of my selections each day. The whole crux of this method is based simply upon getting value. The other requirements are there to reduce the number of selections, to improve the strike rate and to decrease the drawdown. These other requirements, as you will read, are optional but everything that I do is disclosed here. If the explanatory text after the rules seems too much, then just simply follow the rules below verbatim, and that will be sufficient. After read the article on this page, please then read Above Average Edge which shows how I reduce my selections to those which are more efficient (written June 2018). This is the one rule that is absolutely non-negotiable. If the price of the horse doesn't exceed the value rating listed in either the PDF or in the CSV file then it's not to be backed. In the PDF file the value price is at the far right hand side of the data, in the second to last column. The data is given as fractional odds, such as 13/2. In the CSV file the fractional odds are given in column AV. However, in column AW the odds are given as a probability value (i.e. between zero and 1.0). If one wishes to convert the probability into decimal odds then all one does is to invert the probability which is just another way of saying divide that figure into 1. For example, a horse with a probability of 0.25 is 4.0 in decimal odds (this is done by dividing 1 by 0.25), which is the same as 3/1 in fractional odds. This a mandatory rule for both the Turf and the All-Weather racing. In fact, it's a mandatory rule for any selection that I make, even the manual cherry-picks. If I can't get the value price, then I am not on it. All of these rules below are optional. Feel free to remove any of them and, equally, feel free to modify any that you wish. These are the rules that I have implemented and am sticking to. Your view on some of these may vary and you may decide to discard any or all of these, or change them to suit yourself. The reason why we have these rules is to reduce the number of selections. Yes, just backing the value horses should be enough in itself but there is a balance to be made between backing all of the value priced horses and suffering the inevitable drawdown from backing everything. So some form of middle ground has to be found in which a level of profitability is maintained and in which the drawdown isn't too horrendous. The permutations are endless when it comes to these filters and one has to settle on something. These are what I have decided upon. This should be rather self-explanatory about its exclusion from my selections. Quite simply, for the most part, it's awful racing with little or no form and I prefer to avoid it. Your view may differ to mine and, if so, you may wish to include National Hunt Flat races in your selections. I have, quite simply, chosen not to. Now there are other races that you may wish to avoid. Some people have a natural aversion to, for example, Hunter Chases but as I find that these are, perhaps surprisingly, profitable I am still backing horses in Hunter Chases: even the maiden hunter chases! This figure for the Value Of Probability (or VOP) has been chosen here because it's just on the inside of 14%. This percentage of 13.8% was chosen because I wanted a higher strike rate than previous years when I went for 10% as a minimum price, and I was willing to sacrifice a number of value winners to maintain a good strike rate. I know of people who have chosen 9% as their minimum figure and some have even gone down to 7% as the minimum price. The lower the VOP the greater number of selections one will have, the lower the strike rate but this will be off-set by the number of larger priced winners. I have chosen 13.8% for my minumum VOP and, in time, I may run a second betting account with a lower VOP. The figure you choose here is up to you. The top-rated 'get-out' clause needs some explanation. Sometimes in a race with lots of runners, even the top rated horse may not have a VOP high enough to qualify and I have decided that no matter what the VOP is for the top rated it could be selected. The County Hurdle at Cheltenham, in 2018, is a case in point. The top rated won at a fantastic price even though its VOP was low (but, of course, still the highest in the race). Again, you may choose to not allow top rated horses a 'bye' from this clause and you may decide on a different minimum VOP. I have, as I have said, chosen 13.8%. You may choose different. Note that this applies to both the turf racing and the all-weather racing for me. This is somewhat similar to the above VOP requirement in that I have chosen to look at horses that are rated within 10lbs of the top rated horse. This tightens up the selections a little, but some of you may decide to drop this requirement altogether or to keep this one and drop the VOP requirement. Of course this value could easily be changed to 15lbs or up to 7lbs behind the top rated. 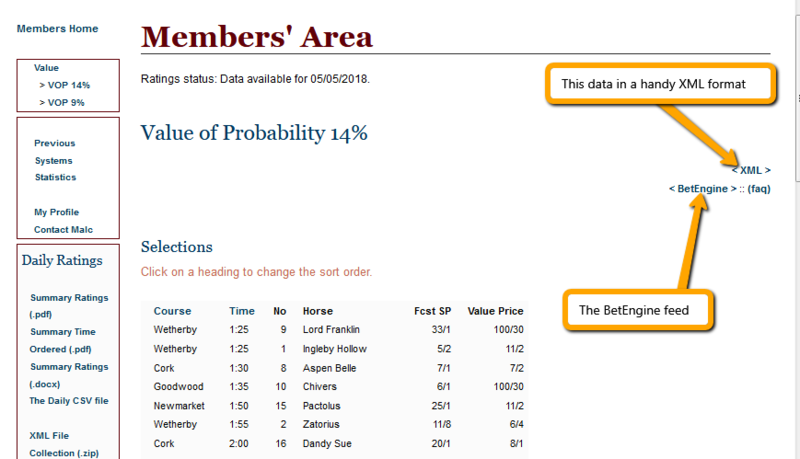 This can be found on the PDF files by looking at the Rating value and then looking down the list until we see a horse whose rating figure is more than twelve pounds behind the top rated's Rating. Alternatively, in the CSV file column OK has this information. This is a personal choice. I don't like backing anything in races with fewer than five runners. You may feel the same or you may feel that you prefer races with a different minimum set of runners. I've simply said that I don't want to consider anything in races with fewer than five entrants. This is something that I have found that really has a positive impact on the drawdown, the strike rate and the profit. I have experimented with having to have a positive one-year class differential and that was good, but I was missing out on a good number of winners and, as always, it's a juggle between over-filtered and not having enough filters. I also experimented with having non-zero 1 year class differentials that weren't lower than -5.0, but that was getting a little over-filtered for my liking. So, in the end I went for non-zero 1 year class differential figures. What does this actually mean? Well, it simply means that this horse has run in this race type in the past year and, therefore, should know what it's doing. If this filter is excluded then the profit will increase but so will the drawdown and the balance, to me, is in favour of this filter. In the PDF file the value can be seen in column 'dd' under the main ratings block and in the CSV file the column you will want is FY. It's been commented on, time and time again, that horses which win with good prices have been well rated, either this time, or the last time. Sometimes it could be said that it appears that the ratings get the selection "one race early" and after some research we found that there's something in this. Anyway, to cut a long story short, I decided that this was a good filter to exclude all horses which were rated ninth, or lower, in the horse's previous set of ratings. This does seem to cut down the drawdown at, yes, some winners. Again, if you feel that this is one filter too many, or it could be slackened or tightened then this is up to you. The exception to this rule for me is that if the horse running today is top-rated then we needn't look into its past; it's a top rated horse after all and I am keeping it in. This information isn't available within the PDF document but is available within the CSV file in column OJ. For the all-weather, and only the all-weather, there is a the requirement that the race has to be a handicap or a nursery (which is, of course, a handicap race for two-year olds). This is the only difference between the turf racing and the all-weather racing: the turf racing doesn't have restrictions on stakes (non-handicap) racing whatsoever. Within the Members' Area, when one has logged in, the links to the VOP 14% page, and also the VOP 9% page, are clearly visible. The potential selections for the VOP 14% are clearly laid out as shown here. The above example (5th May, 2018) shows the first part of the list of potential selections in the main panel. Those following this particular selection method will simply back all of those horses whose price equals, or is greater than, the Value Price. The above screenshot shows two links which should require a little further explanation. The XML link downloads an xml file which contains the same information that is visible but in xml format. Handy for importing into various tools or spreadsheets. The BetEngine feed is a CSV file which has been created especially for The BetEngine, the exchange bet placement tool of my choice. Those using the BetEngine and this feed will find it easy to download this feed, import it into The BetEngine and then leave it running. This one one doesn't have to worry about putting on dozens of bets in the morning: the tool does it for you. Most days there are a few of us who post our selections up on the forum for other members to read and follow, if they wish. Mine, as you will have read above, are based upon the minimum VOP of 13.8%. Others who post may have chosen a different VOP value of, say, 9% or 7%. Or they may have decided to slacken other filters or demand that the minimum price has to be the tissue price and has to be at least 10/1 rather than my choice of 9/2. Each are profitable and will they will return a different profit and, of course, will require a different number of selections. But the point is this: the selections are posted by a number of us each day to share and a good number of members just simply wait for these to appear and to follow these selections without having to trawl through each race's prices in turn to see which horse is value. So, if what I have written does sound interesting but the hard slog of going through each of the races in turn sounds too much, and I can appreciate it if it does: then just pop onto the forum on the morning of the racing. There are other selections that I am doing in addition to the above. One of these is, for example, Rob's Selections that I am following each day. These are listed on the forum every evening. Rob's selections work on the same principles as the VOP 14% method; which is basically value horses at, or near, the top of the ratings. And this is basically what I do each day. Of course what I back will be different to what you back depending on the prices available. I try to get on with the exchanges early on but if I think that the price may drift out I have now learned to take half now and the other half at Betfair SP. I learned this lesson when a horse I was going to back was over 100/1 on the exchanges and I thought that it would drift out further. But, no, others had the same idea and it won at something around 20/1. As I have said in this wall of text this is what I do day in and day out. I sometimes cherry pick on the quieter days and, even then, I make sure that I always get a value price. If you have any questions then please contact me via email or on the forum. You now may read the Above Average Edge article that was mentioned at the top of this page.